Environmental planners decide how to use land to meet the needs of people and nature. They have a focus on sustainability, which is development that meets the needs of the world at the present without stopping the world from being able to meet the needs of people and nature in the future. An environmental planner may work on reducing the environmental impacts of construction projects, such as housing, transportation or industrial buildings on the natural world, or may be involved in protecting existing built environments from flooding or coastal erosion. Environmental planners use maps in their work to monitor changes in buildings, roads and to detect loss of habitats for wildlife, and also to make plans for the future by analysing what has happened in the past. Do you have the attributes and skills to be an environmental planner? Environmental planners are passionate about sustainability and the environment. They are tenacious in their opinions on how to preserve and protect the world for the future. They are excellent communicators of their environmental plans and the reasoning behind these. Can you find your house on a map? Google Earth is the world’s most detailed globe. Click here to see if you can zoom into your house from space. Google Maps (click here) gives you both maps and satellite views of the same area, along photographs of what you might see. Can you find your house? Your school? Any other interesting features? Mappleton is a village in the East Riding of Yorkshire, situated on the Holderness coast. It has about 50 properties and has been eroding at a rate of 2 metres per year. The road is now only 50 metres from the coast at its closest point. Erosion is happening so quickly here because the cliffs are made from a rock called boulder clay which is soft and crumbles easily. Click here to watch videos with more information about coastal erosion and the Holderness coast. 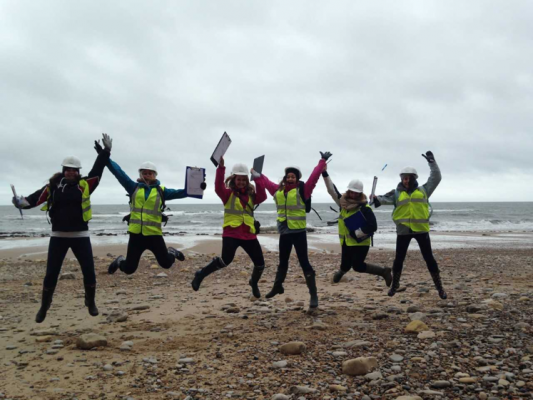 How can we save Mappleton from the sea? What did the environmental planners do? In 1991 £2 million was spent on a rock groyne which trapped beach material and created a wide sandy beach, and a rock defence to protect the cliffs. This meant that the sea was not able to reach the base of the cliffs at Mappleton and cause further erosion. The cliffs between the groynes have been stabilised using a cover of vegetation. This has successfully halted erosion between the groynes, but further south the rate of erosion has increased. This is because the sand that would have been deposited here to protect the cliff has been trapped by the groyne. In 2015 a large crack appeared to the south of the sea defences. Does this matter if the houses are protected? What would you decide?